L string (extended) = 505 mm, W glass bead = 9.5 mm, Th glass bead = 8.5 mm, diam shell bead = 9 mm, th shell bead = 2 mm; diam cord = 1.7 mm [RTS 3/6/2004]. Collected by Percy Horace Gordon Powell-Cotton and his wife on 13th February 1933 during a shooting expedition. Light yellowish brown cord (Pantone 7508C) made of twisted and plaited plant fibres, possibly grass, onto which have been strung 200 circular white ostrich eggshell disc-shaped beads (Pantone 7506C) and two faceted short-bodied beads with hexagonal sections in opaque blue glass (Pantone 2728C). These have been strung as a sequence of 106 ostrich eggshell beads, the two glass beads at the centre, and then 99 shell beads on the other side. Both ends of the cord have been knotted, to keep the beads in place, with short lengths left free for fastening the ends together, and a final knot near each end to prevent the cord from fraying. The necklace is complete, but the surface of one glass bead is slightly chipped. The ends have not been fastened. It has a length of 505 mm when the string is fully extended, and a weight of 54.1 grams, while the cord is 1.7 mm in diameter. The eggshell beads are mostly of a similar size, with diameters of 9 mm and thicknesses of 2 mm, although these become slightly smaller to one end, down to a minimum diameter of 6 mm, while both glass beads are 9.5 mm by 8.5 mm wide, and 8 and 8.8 mm long respectively. Collected by Percy Horace Gordon Powell-Cotton and his wife Hannah at Loronyo on 13th April 1933, during a shooting expedition. The Lotuko name for this type of object is said to be wara. It has similarities to 1942.1.450, a multi-stranded necklet strung with ostrich eggshell disc beads and blue faceted beads of the types seen here, and of similar dimensions; the donor and cultural group of that object are unclear. Similar faceted blue beads also appear on a Dinka neck ornament in the British Museum (exhibited in the British Museum reading room in 2004 as part of exhibition 'Sudan Past and Present'). Carey suggests that ostrich eggshell beads were made by chipping the material to the correct size then boring a hole through it, after soaking the eggshell in water to prevent the material splitting. Several partially worked beads could then be strung together and the edges ground to finish them off. It was possible to make around one hundred beads of this kind per day (M. Carey, Beads and Beadwork of East and South Africa, 1986, p. 9). This object is currently on display in the Lower Gallery, case 104A. Accession Book Entry [p. 248] 1934 [insert] 8 [end insert] - MAJOR P. H. G. POWELL-COTTON , Quex Park, Birchington, E. Kent. Specimens collected by himself & Mrs Cotton, during hunting trips, 1933, viz: [...] [p. 252] - From the LATUKA tribe, NAVERA, TORIT, LARONYO. [p. 254, insert] 69 [end insert] - Necklet, wara , of ostrich-egg-shell discs, ib[idem] [LARONYO] (550). Card Catalogue Entry - There is no further information on the catalogue card [RTS 28/5/2004]. Old Pitt Rivers Museum label - Wara , necklet of ostrich-egg-shell beads. LATUKA, LARONYO, E. SUDAN. 4° 38' N., 32° 37' E. d.d. Major Powell-Cotton, 1934 (550) [Rectangular metal edged tag, tied to object; RTS 2/6/2004]. Related Documents File - Typewritten List of "Curios Presented to Dr. Balfour by Major & Mrs. Powell-Cotton. Latuka Tribe". 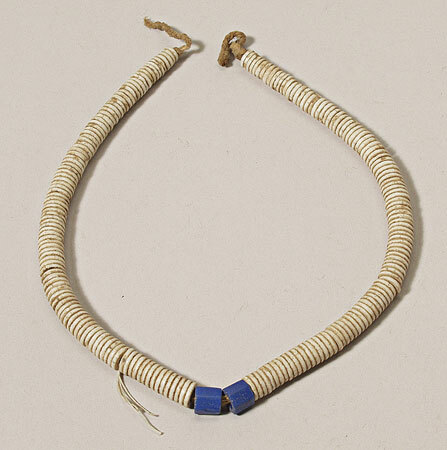 This object appears as item 550: "Ostrich shell necklace, 2 large blue beads, native name Wara , 13/4/33 Laronyo 4.38 N 32.37 E”. Also contains details of a cine film 'some tribes of the Southern Sudan', taken by Powell-Cotton during this 1933 expedition, copies of which are now in the National Film and Television Archive and the Powell-Cotton Museum in Kent [RTS 14/3/2005]. Sparks, Rachael. "Lotuko necklet" Southern Sudan Project (in development). 03 Jan. 2006. Pitt Rivers Museum. <http://southernsudan.prm.ox.ac.uk/details/1934.8.69/>.